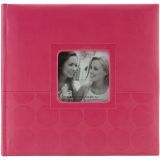 Embossed 2-Up Photo Album 4"X6" 200 Pockets - PIONEER-Embossed 2 Up Photo Album. A perfect way to store your memories! Features an embossed leather cover and rounded spine. This package contains one 8-1/2x9 inch photo album with 200 4x6 inch pockets and journaling space next to each pocket. Comes in a variety of styles. Each sold separately. Acid, lignin and PVC free. Imported.